Neil and I just returned from our first trip to Europe filled with photos and notes about wine and cheese. We chose to have a wine experience on a train from Paris to Milan. The scenery was beautiful, passing vineyards and countryside. It only seemed appropriate that we have some wine and cheese. 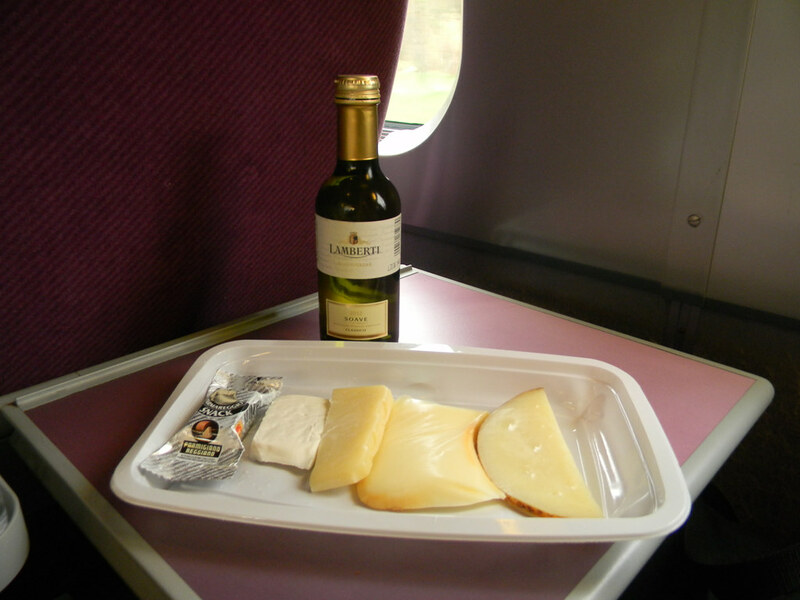 I went to the dining car to see what was available, choosing the half bottle of white wine and cheese plate. Soave is an Italian wine, and when I looked it up, I found out it is a blend of garganega, trebbiano di Soave and chardonnay. Without knowing about this blend we did our initial swirling to see what aromas we could identify. I picked up a crisp apple while Neil noticed tropical fruit, green apple and a hint of oak. Neil tasted a crispness with green apple and pear. I agreed with the apple and thought it tasted clean and made my mouth water. Since there were 5 cheeses in the cheese plate, we each chose two to taste. We’ll call them 1-5 from the left of the photo. We did not know which cheeses are on this plate so it was a fun guessing game. Neil started the cheese tasting with number 3, which looked dry but was actually chewy and mild, and tasted like cow’s milk. My first cheese, number 5, smelled smoked or like provolone. The texture was waxy and harder than expected, while the flavor was maybe herbal or vegetable. Neil moved onto cheese number 4, maybe a smoked Gouda? It was very soft but cold, perhaps it would have been creamy if it had warmed up? My next cheese was number 2, a cheese that looked like feta and had a similar flavor to goat cheese. It was definitely a complex cheese; thick, a little tangy, coated your mouth, had a good flavor and almost tasted like yeast or bread. It was fun to come up with what we thought the cheese would be like from appearance and then have it change once we tasted it. For the wine and cheese pairings, we each chose the cheese that we felt would work best with the wine. I paired the Soave with cheese number 2 and noticed the wine flavor to increase and the body to become more full. The cheese was slightly tangier but I still identified the bread flavor. Neil paired the Soave with cheese number 3. He found the creaminess to increase for the cheese and the wine to become a little sweeter. We both felt we made a good pairing. I was so surprised that the cheese could make the wine seem more full-bodied since that hasn’t happened in any of our other pairings. It was definitely a fun WineAndCheese, and to bring it to a close, we had a charcuterie plate. Delicious! Previous Post: Maria and Neil are in Europe, check back next week!